I've baked numerous butter cakes. Even though I like foolproof ones, which means I always use back the same recipe, I'm also adventurous to try new recipe. 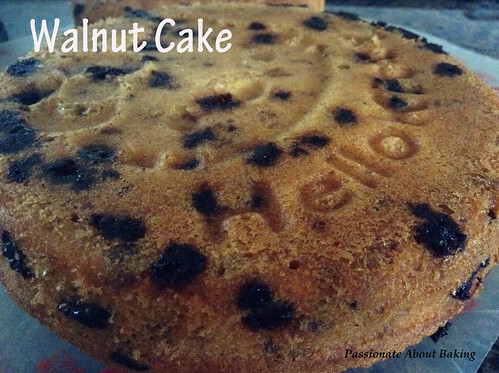 I tried Sonia's walnut butter cake. The top browned very fast and is very crispy. 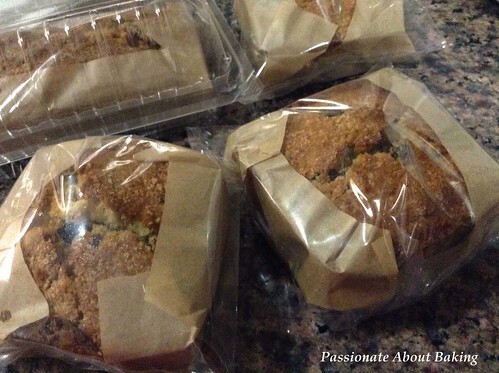 I baked it in numerous sizes to give away to my colleagues. 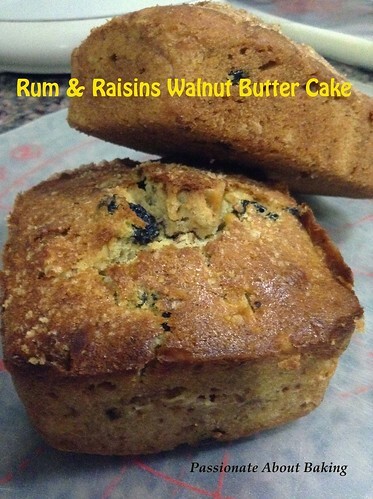 Recipe for Rum & Raisins Walnut Butter Cake, adapted from Nasi Lemak Lover. 3. Fold in sifted cake flour and baking powder, alternate with milk. 4. 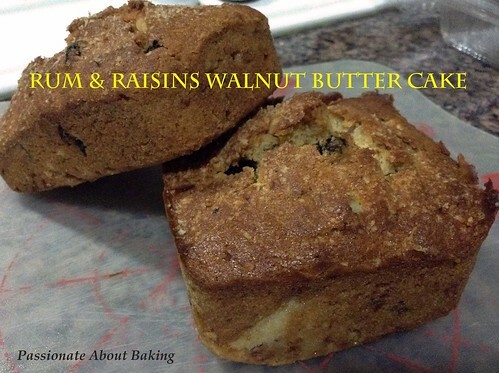 Mix in rum raisins and walnut, don't overwork it. 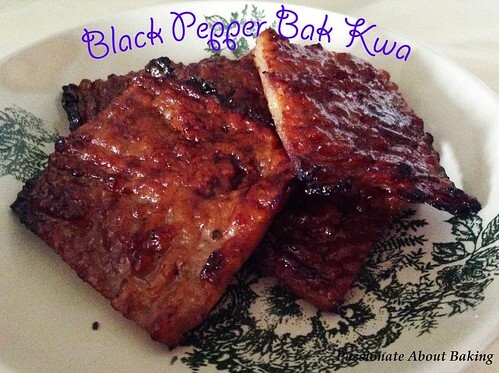 I took great interest when I saw this recipe online - Black Pepper Bak Kwa. 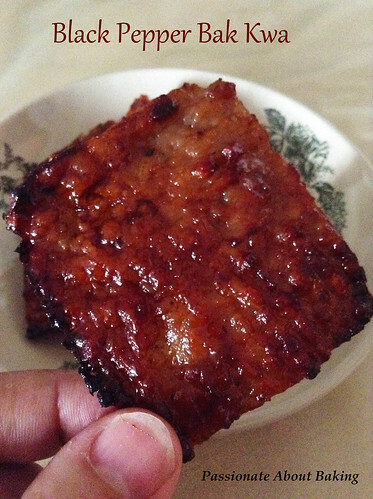 I've tried the normal Bak Kwa before from Sonia's blog. I thought it will be interesting to make a Black Pepper version. If there is a chilli version, I would very much want to try it too! The bak kwa is sweet and has a subtle black pepper taste. It is really nice, something different from the normal bak kwa. I will strongly encourage you to try if you are adventurous. I did some modification to the method to make it easier. 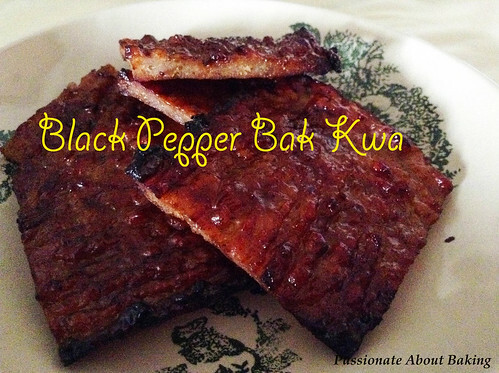 Recipe for Black Pepper Bak Kwa 黑胡椒肉干, adapted from Epicure Asia. 1. Combine the minced pork with all the ingredients (except honey) in a deep dish. Mix the ingredients in a circular motion until the red hue is even, about 15 minutes. The mixture should be of a slightly gluey consistency. Cover the dish with cling wrap and refrigerate for one day. 2. Using a fork, spread the meat mixture thinly (about 5mm). 3. 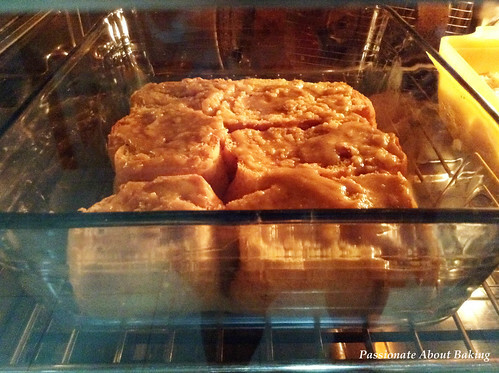 Place the bak kwa in a preheated oven of 160°C for 15 mins. 4. Remove and let it cool slightly. Then cut into desired shapes (squares or rectangles). Meanwhile, switch the oven to grill and turn the temperature to 220°C. 5. 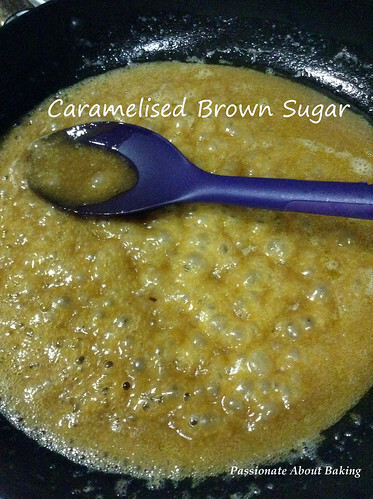 Brush with with honey and grill for 8 mins or until the edges start to char slightly and caramelised. Remove the tray from the oven, turn the meat over and brush with honey. 6. Continue to grill for another 8 mins. Remove and let it cool completely before serving. I'm submitting this post to Aspiring Bakers #39: CNY Rock and Roll! (January 2014) hosted by Food Playground. Chinese New Year is just round the corner. 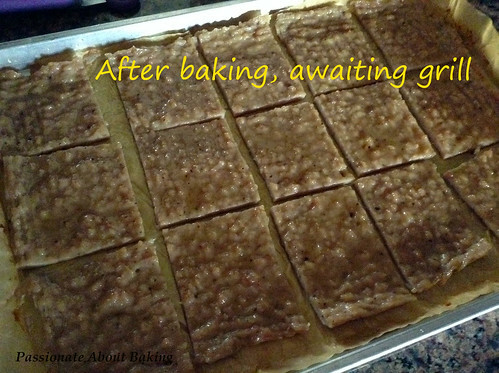 I have started my planning for the cny goodies baking over the next two weeks. I thought Saturday was too early for the goodies, so I decided to bake some Walnut Cake for my sisters instead. 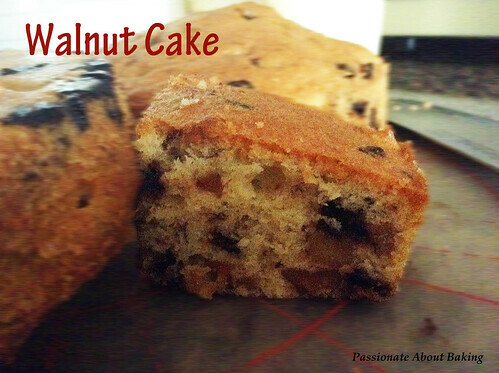 I realised that most walnut cake included some chocolate chips. For this recipe, I think it will be good to reduce the chocolate chips as I found it too sweet. 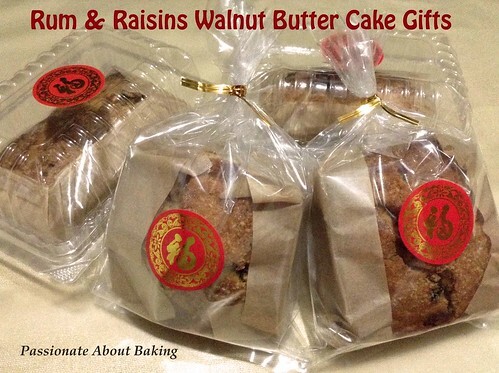 Recipe for Walnut Cake, adapted from Alex Goh's "Creative Making of Cakes"
Cream (A) till light. Add (B) and continue to whip till light and smooth. Whip the egg whites from (C) till foamy. Add sugar and continue to whip till stiff. Mix the whipped (C) with the above batter till well blended. Fold in sieved (D) and mix till well combined. Add (E) and mix till well incorporated. Pour the batter intot he greased and lined mould. 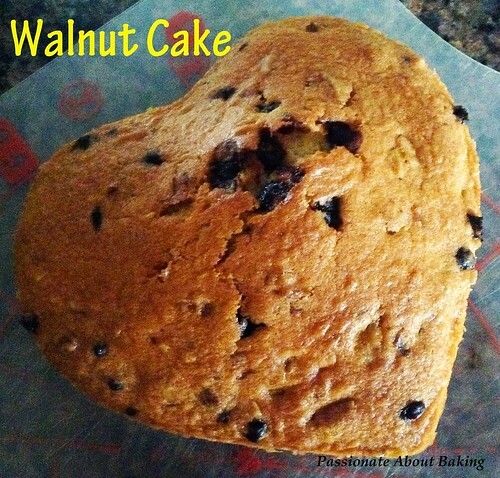 Sprinkle some extra walnuts on top (if want). Bake at 180C for 40mins (for smaller pans) or test until skewer come out clean. 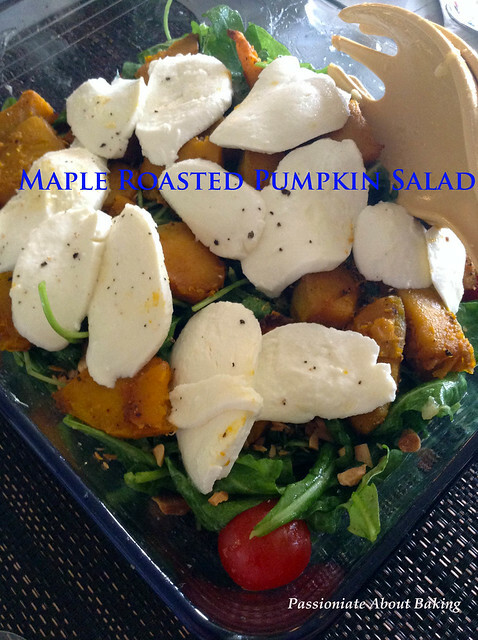 My first experience for new year 2014 was to make a Maple Roasted Pumpkin Salad. It was so good the salad was finished within minutes with my family members. Enjoy a healthy start to a new year! Recipe for Maple Roasted Pumpkin Salad, adapted from Martha Stewart. Preheat oven to 200 degrees. On a baking sheet, toss pumpkin with 2 tablespoons oil, garlic, red pepper, smoked paprika, salt, and black pepper. Roast together with garlic cloves, tossing occasionally, until pumpkin is tender, 25 to 30 minutes. Remove garlic cloves from sheet pan; set aside. Drizzle pumpkin with 2 tablespoons maple syrup; toss to coat. Return to oven and continue roasting, tossing occasionally, until pumpkin is glazed, 5 to 10 minutes more; let it cool. Meanwhile, cut off root ends of garlic cloves; squeeze out garlic and mash to a paste with the side of a knife. Transfer to a bowl. Add lemon juice, mustard, and remaining maple syrup; season with salt and pepper. Whisking constantly, add remaining oil in a steady stream; set aside. Add wild rockets and tomatoes, toss to combine. Drizzle the dressing and mix well. Serve salad topped with pumpkin and mozzarella cheese and sprinkled with toasted almonds. As it was coming to the end of a wonderful 2013, I decided to organise a New Year's Eve Potluck Breakfast for my colleagues in the same office floor. I thought it was a good way to end the year with a simple gathering and food. Food usually brings people together. 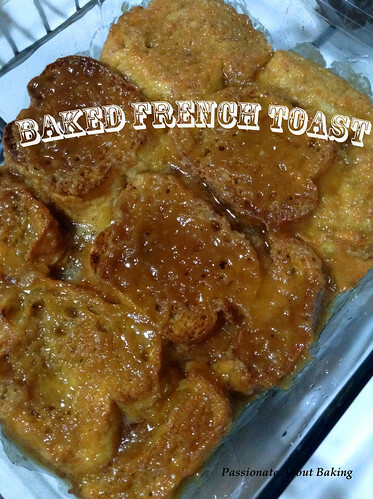 So after all of them have decided what to bring, I decided to do a Baked French Toast. I've seen this recipe for quite a while and was really interested to do it. When better to do it then this time? I watched the video, read the reviews and modified the recipe. It turned out to be really good. And I was glad my colleagues like them too! I love it myself, the top was crispy and crusty while the bottom was soft like beancurd. The taste was really great. Try it! 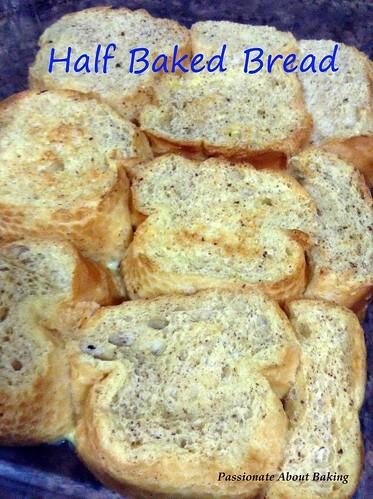 Recipe for Baked French Toast, adapted from Allrecipe.com. 1. 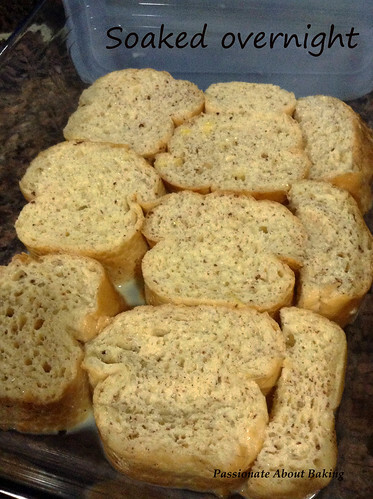 Arrange the slices of bread in the bottom of the baking dish. 2. In a large bowl, beat together eggs, milk, vanilla and cinnamon. Pour over bread slices, cover, and refrigerate overnight. 3. The next morning, preheat fan oven to 160C. Bake the bread in the oven for 20 mins. 4. While the bread is almost done (before the 20mins), in a small saucepan, combine butter, brown sugar and corn syrup; heat until bubbling. 5. Then remove the pan from the oven, pour over bread and continue baking for another 20mins. 6. Remove from oven and let it cool slightly before serving.